This practical guide provides a comprehensive and inviting introduction to English-language children's literature from the eighteenth-century to 2000. The book contains a discussion of the often controversial theory and history of this influential and entertaining subject, and explores the ways in which it can be approached. The Guide includes: -Detailed critical surveys of the work of forty major authors, from Mrs Sherwood to J. K. Rowling, Louisa May Alcott to Dr Seuss, Mary Grant Bruce to Margaret Mahy, and Quentin Blake to Ted Hughes. - Studies of key texts, placing each in its historical and generic context: books include the pioneering A Little Pretty Pocket Book (1744), classics such as Tom Brown's Schooldays, The Adventures of Tom Sawyer, and Seven Little Australians, modern classics from The Hobbit and C. S. Lewis's 'Narnia' books, to Charlotte's Web and Harriet the Spy, as well as influential translations, such as Emil and the Detectives. - Discussion of important issues, themes and genres, including censorship, postcolonialism, fantasy, gender, illustration, and literacy. 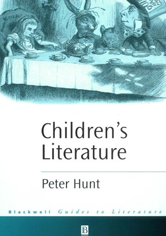 Children's Literature offers a helpful and inspiring foundation for further study, and will be an essential resource for students from disciplines as varied as literature, history, education, cultural studies, and the general reader.